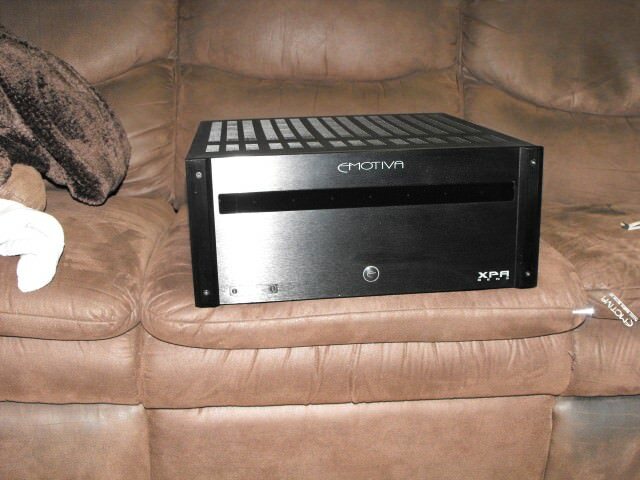 Forums » General Discussion » Home Theater » Putting together a Home Theater System 5.1 or 5. #429979 - 09/08/18 07:53 AM Putting together a Home Theater System 5.1 or 5. I have tried contacting Axiom help three times through email and twice by calling the 888 number. But have not received any response back from Axiom. So I am going to give this media a try for help (Frustrated). We are in process of moving to a new house and want to set up a home theater for music listening and watching movies. The room is 4,400 Cu. Ft. with three walls, the fourth wall is open and shared with the Kitchen and the dining area. Wall 1 will have the TV and the Left, Center and Right speakers. Wall 2 has a large window that will be covered with curtains Wall 3 is the back wall. This wall has a large patio door on it and will have two rear speakers. Wall 4 is open and shared with the kitchen. I know that this is not anywhere near an ideal room for this purpose. However this is what I have to work with. I want it to sound the best I can make it given the conditions. I would like to put together a 5.1 or 5.1.2 system. I will be using on the wall speakers. VP 150 as the center speaker. I have a Klipsch sub-woofer that I plan on using as the .1 speaker for now. I would like to use either the M2 or M3s as the rear speakers and the .2 speakers. I would like some help in selecting the .2 speakers. My receiver is a Denon AVR X4400H. Have not selected a TV yet. Any advice is appreciated. Thank you in advance. This is really surprising to hear Axioms customer service is excellent.Have a look at the VP180 or the VP 160 .I had the VP 150 and changed out to the VP 180 on a trade in big difference . You may have missed them for the weekend, I would try calling them Monday. Depending on your listening levels, M22's may be too taxed in that large of an area and I agree with Rj, the VP160 or 180 will be a noticeable improvement over the 150 for centre duty. Your room is a similar size to mine. In-ceiling M3s will give you a better low frequency response for Atmos than M2s. The M2s might bottom out depending on the volume and cross-over frequency. I know you didn't ask but I have to say it. Plan on trading in the 150 for the 160v4 - best thing I did next to trading in my 600v2 for the 800v4. As for the M22s, maybe one day you might want to try the M5HP. As for Klipsch, they've never engineered a sub they can be proud of. How did you decide on bipolar speakers for the rears rather than quadpolars like the QS10HP? I don't see how the M22 would be taxed at all if you set the system up right. You don't set it as a large speaker trying to get it to do full sound range. With a good quality sub and put the crossover at around the 120hz mark and the speaker will not bat an eyelash at it. You will need to have a sufficient enough sub, however, to lift the lower frequency weight if you want to play at a decently loud volume. I have yet to figure out why people want to move to the overhead speakers. I have concluded that there just isn't enough good source out there to justify it and it is not like the major streaming companies give you enough bandwidth if they are streaming atmos to really give you the sound. so you are now stuck with paying the cost of buying 4k discs to watch. Perhaps i am not that much of a die hard to see the cost benefit. Just to clarify. All the speakers need to be on wall speakers except for the sub-woofer. I plan on trading in my bookshelf M22 for on wall M 22. You guys have convinced me to go to a VP 160 or 180 for the center. Which on wall speaker from your experience will sound better with this setup the M2 or M3? Again all speakers have to be on wall. I addition how far from the sidewalls should the M22s be for best sound? As far as the Sub-woofer I am going back and forth between the EP 350 and the EP 500. It seems that for my size room the EP 500 is a better choice. Given the cost though I wonder if I could get away with the EP 350. My other option is to stick with the Klipsch sub-woofer I have and see how it sounds. 1. the M3 will sound better than the M2. 2. the M5HP will sound better than the M3. You can get it in an on-wall version. 3. Forget the 180. The 160 is a must and it will not leave you wanting a 180. This will free up some cash. 4. You will never know how bad the Klipsch is until you get the EP500. 5. If money is tight, defer the atmos speakers. Trade in whatever you have for a pair of M5HP for front, a VP160, an EP500 and M3s for the rears. 6. Ask Ian if he can build you an EP500 in an NME version. I expect he'll do it no charge if you do this deal. You'll have an amazing system! The EP350 will not go as low, will not be as tight as it isn't a sealed unit. As they come with a volume control, you can easily turn down a sub so that it works inside a room. The inverse is not possible. If you have a sub that is too small, it simply cannot move enough air fast enough to pressurize the room and you will never get that wow factor. If I had a choice between getting M22 + EP350 or M3 + EP500, I would put the money into the sub hands down every day of the week. You will get far more bang for your buck in sound from a quality sub with a pair of effectively bookshelf speakers than you ever will from going higher quality on the bookshelf at the expense of the sub. One dimension I didn't see yet is how far the listening position will be from the LCR speakers (and from the screen). That is IMO the main determinant of how big/beefy your LCR speakers need to be. Room dimensions probably would help as well... we are probably all guessing something like 20-ish x 20-is x 10-ish but we could all be wrong. Another vote for investing in center channel and sub. This is why i like this forum, you get no BS answers and no one beats around the bush. Never skimp on the sub and buy right the first time. I have been down the same road and started small because i was worried about having to ship stuff back, big mistake since i ended up having to buy twice. Adjust your budget or get things in stages but dont skimp out, buyers remorse is horrible . THE SUB IS THE MOST IMPORTANT PART OF HT . not because how loud i goes ,its about how it pressurizes the room and if its not big enough to do it then its just a fart can.